In 1931, Cadillac sold a series of cars based on a 16 cylinder engine and frame. A number of body styles were offered: Coupes, Town Cars, and Sedans were most common. About 20% of the cars were produced as convertibles or open cars. The 1931 Cadillac was the flagship of the Cadillac line in 1931. Also known as the “All Weather Phaeton”, the car listed for $4895, plus options, a huge amount in those days. (A 1931 Ford Sedan cost about $600.) Some of the cars had bodies by Fisher, but a majority had semi-custom bodies outfitted by Fleetwood. Choosing from a list of body and styling options, the buyer could create a car from about 50 different possible body styles. Like all of the V-16 Cadillacs, the Phaeton was loaded with the latest automotive technology. The car featured a 7.4 liter V-16 engine, which developed 165 hp. The engine featured a new overhead valve technology, and the car had “adjustable ride control”. The kit is part of the “Classic Jewel Series”. I’ve never seen any of these kits before, so I had no idea what other cars may have been in the series. A quick web search turned up a few other cars in the series: A 1930 Packard Victoria, a 1934 Dusenberg SJ, and a 1930 Mercedes 540-SK. My kit has a 1977 copyright date on the side of the box- and a note that says it was printed in England. I am guessing these kits haven’t been in production for some time. This kit’s attraction is that it is in 1/48 scale—it could be posed with a number of aircraft models. The model could be posed with aircraft from the 1930s. Suitably distressed and weathered, it could be an old car posed with WW2 aircraft- a well used car owned by a pilot. The kit consists of about 50 parts. 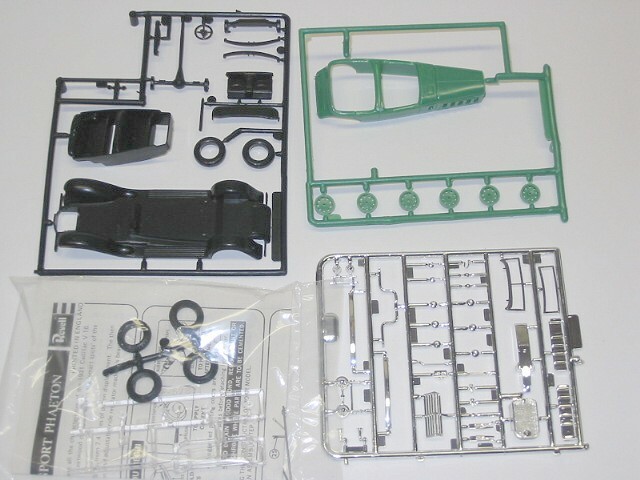 The kit includes four sprues—one molded in black, green, clear, and a sprue of chromed parts. The kit includes separate vinyl tires, and steel axles for the wheels. The parts are generally well molded, with good mold alignment. While the kit is molded in green, it seems that the car came in a variety of colors, so could be painted any color you might choose. The instructions are a single page of instructions printed front and back. There are no options in construction- this is, after all, a fairly simple kit. The kit looks to build into a model a little over 4 inches long. Recommended. This kit seems to be a pretty rare subject—one that may appeal to 1/48 scale aircraft modelers. Kits of autos that can be posed with WW2 aircraft are pretty rare. Review kit courtesy of the Southern Maine Scale Modelers DownEastCon kit raffle.